Eames Century Modern is a typographic workhorse that honors the Eames aesthetic while offering unprecedented functionality. An eighteen-style serif typeface family strikes an unprecedented balance between distinctive idiosyncrasies, readability and space economy. 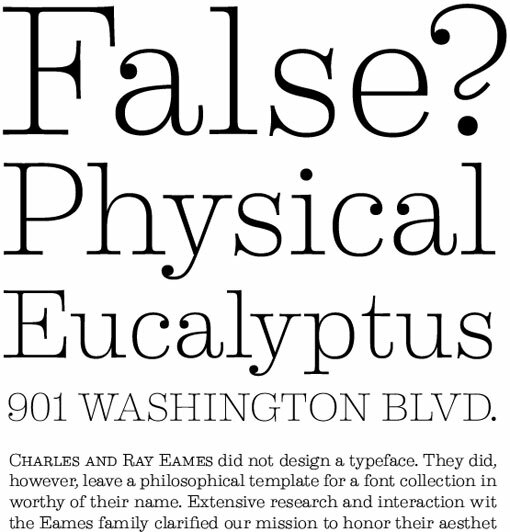 Its 18 styles include gracefully complementary italics and a virtually endless supply of deep text handling features. Carefully-weighted small caps, nine different figure styles, ligatures, contextual alternate forms and thousands of lines of computer code give Eames Century Modern a significant edge in contemporary design environments. 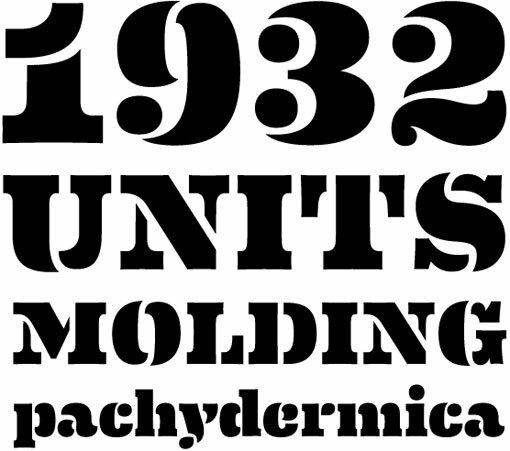 A stencil font on the heaviest weight of Eames Century Modern takes the curvature of bent plywood and abstracts the shapes into type. That Black is like a modern stencil. Very slick.